Here's a quick giveaway for some nice jewelry from PicturesOnGold.com. You only have a week to enter, ending 2/11. US only. Prize value $170+. Good luck. Thank you to PicturesOnGold.com for sponsoring this giveaway. Welcome to the Valentine's Day Giveaway brought to you by PicturesOnGold.com! "PicturesOnGold.com creates the finest Photo Pendants and Charms, Gold Lockets, Silver Lockets and other Personalized Photo Jewelry in the industry. We create lasting photo lockets and photo jewelry keepsakes using only the finest 14k gold, white gold and Sterling Silver. You send us your photos and using our patented technology we laser engrave your pictures in color right on our gold lockets, silver lockets, locket charms and most of our custom jewelry. The results are gorgeous gold lockets or silver photo lockets that open to reveal your photos and can be worn as a beautiful photo or picture locket." 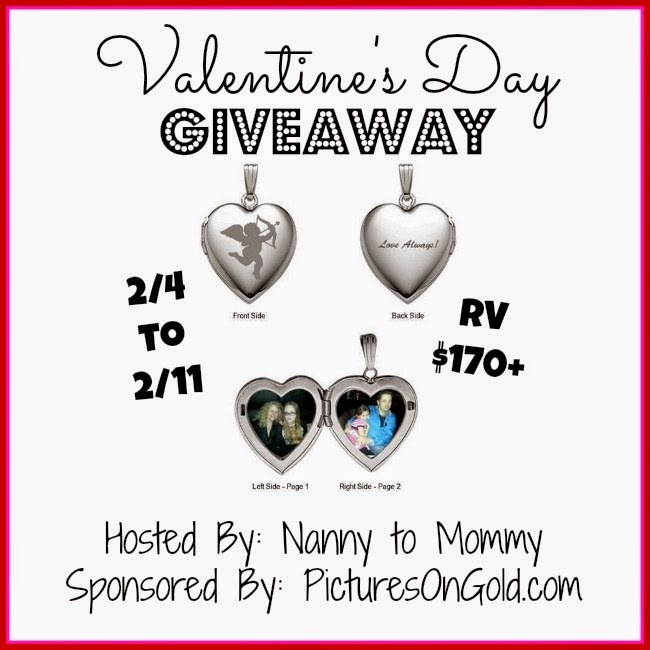 I am excited to offer one lucky reader the opportunity to win a beautiful Two Photo Sterling Silver Photo Heart Locket 3/4" x 3/4" (Value $170.90) includes an 18 inch SS ROLO chain. This giveaway is open to US only, must be 18+ to enter. Good luck! Disclosure: This contest will run through February 11, 2015 at 8:59 pm PST (11:59 pm EST). Winners are chosen via Random.org, ALL winning entries ARE verified. The winner will be notified by email they signed up with and will have 48 hours to reply or another winner will be chosen. No purchase necessary. US entries only. Must be 18 years or older to win. This giveaway is sponsored by PicturesOnGold.com. I received monetary compensation to share this giveaway. This promotion is in no way sponsored, endorsed or administered by, or associated with, Facebook. You understand that you are providing your information to Nanny to Mommy and not to Facebook. Please note that Nanny to Mommy and participating bloggers are not responsible for sponsors that do not fulfill their prizes. I have represented the sponsor with the expectation they will fulfill their prize and in a timely manner. I will contact the sponsor regarding your prize. The sponsors, in most cases, are shipping their items to you directly. I will make every effort to assist you in obtaining your prize. If there is an issue with a sponsor, please notify Nanny to Mommy at Diana.n.chastain@gmail.com within 4-6 weeks for assistance, after that I may be unable to assist you. I'd keep it for myself, with pictures of my parents, now gone, but so much loved. I would give it to my daughter that is away at college. I would put family pictures in there for her to show her that we miss, love and are very proud of her. I'd love to keep it, so I could keep photos of my kids close to me in a beautiful locket. I would keep it for myself to put pictures of my family in. I would keep it for myself and put pictures of my daughter inside. I'd probably keep it and put both my kids photos in it, or give to my friend for both her kids pics. I'd give this to my eldest daughter to put in photos of her husband and new baby. I would put pictures of my 7 yr old in there of when she was a baby. i would put my granddaughters on it and keep it myself. I would keep it & put a picture of my 3 kids in it ! I would give this to my mother and put a picture of us together in it =D. I would give it to my wife. If I kept it, I'd put a pic of her and my family in it. As much as a would love it for myself, I think I might give it to my mom with a picture of her grandkids. I know how much they mean to her and how much she misses them. I sure she would cherish it for that reason. I would give this to my mother. She loves jewelry like this. I'd give it to my daughter in June...she's graduating HS and going to college,and I am very proud of her,as she has worked hard! I would keep it and put a pic of my husband and one of our cats. My daughter is a new mom, I think she would love to have this locket. I would give this to my best friend Jo and put a pic of her and her cat. I would keep it for myself and put pictures of my family inside it. I'd give it to my wife so we could put pictures of the children inside. I would probably give this to my mother in law for her birthday and put pictures of my daughter and husband in there! I'd give this to my daughter! I'm not sure which pics she'd want in it, but I know she'd love it! I would keep this for myself and put pictures of my kids in it! I would keep it, put pictures of my sisters and mom. I would keep it and put in pictures of my kids and Mom. I would give it to my daughter-in-law but if I kept it I would put a picture of my granddaughter and husband in it. For myself and I would put pics of my kids in it. Then I would have them with me where ever I go. Would give to my daughter to put pictures of her baby in. I would keep it and put my husband of 31 years picture in it. I'd give it to my daughter with pictures of Daddy, myself and her little sister on it. I would probably give this to my sister. I would keep it for myself and use it in memory of my son. I'd give it to my mom in law and put a picture of her son who passed away. I would give this to my daughter. She could decide what pictures she could place in it. I would give this to my daughter. I would include a picture of my husband and I for her! I'd keep it for myself with pictures of my parents in it. I would give this to my mother with pictures of us Kids and Dad in it . I would give this to my wife if I won and she would probably put pictures of our two sons in it. I would give it to my sister who has a birthday coming up soon. I would give it to my mother in law. I would keep and put a picture of my brand new grandbaby in it. I would give the locket to my mom. Pictures of our new baby! I would give it to my sister with pictures of my two nephews in it! I would give this to my mother with photos of my daughter and son. This would be for me and Jake! i would keep and put pics of my kids in it! I'd give this to my mother, I'd put a picture of my 2 daughters in it for her. I would gift this to my mom, she would probably put a picture of my grandma in it. My mom has not seen her mom in over eight years. I would keep this for myself and put pictures of my grandchildren in it. I would give it to my mother! I would give the to my granddaughters. I would give it to my nieces. I would gift it to my first grand daughter. I'd keep it with a picture of my so that just passed away in it. I would keep a picture of my children in it. 'd love to keep it, so I could keep photos of my kids close to me in a beautiful locket. I would put photos of my Mother & Father in it. I thank you for giving me a chance to do this. I would keep it and I would have my daughter and son's pictures in it. I would give it to my girlfriend.